How do babies benefit from white noise? How do you create white noise? What are the side effects of using white noise for babies? What precautions should you take when using white noise for babies? Soothing a cranky and fussy baby is hard. Parents may rely on everything they can think of to calm down their child. But not many think of white noise for babies, which can work wonders when you make the right choice. So what is white noise and how does it help a baby calm down? 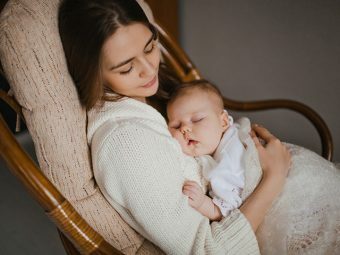 MomJunction answers these questions and also tells you about the precautions you should take while using white noise for babies. White noise is the continuous and uniform noise over one or more specified frequencies (1) (2). In simple terms, white noise is a combination of several sounds, each of a different frequency. The noise from each frequency is consistently present throughout. The term “white” is used as an analogy to white light, which is a combination of light in different colors, from distinct spectrums. Since white noise contains a mixture of different sounds, it is often used to mask other noises and unwanted sounds, making it a useful tool to soothe a baby. Yes. Parents and medical experts observe that infants exposed to white noise can remain calm and eventually sleep better. White noise works with infants because it mimics the steady sounds that a baby would have heard inside the womb (3). A study found that about 80% of infants fell asleep within five minutes of exposure to white noise (4). 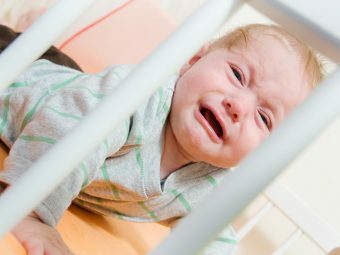 Another research states that white noise is an effective non-pharmacological method to control colic in babies (5). In the long run, white noise can be used to calm colicky babies and also set the baby’s sleeping patterns. How Do You Create White Noise For A Baby? Infant sleep machines: Infant sleep machines are by far the most common choice to generate white noise for babies. These electronic devices resemble a radio but create white noise instead of sounds. These machines have features to adjust the volume and to generate natural sounds such as that of a brook, summer night, etc. The device can be placed in an infant’s room or carried along wherever you are traveling with the baby. Using a phone to generate white noise: You can download a white noise app on your phone and use the phone’s speaker to create white noise. A phone’s speaker may not be as effective as a stand-alone infant sleep machine, but it can still get the job done when you need to calm the baby immediately. Noise from household appliances: You can use noises from regular household appliances to generate white noise for a baby (6). Vacuum cleaners, hair dryers, or cloth dryers are a few that can be used to create white noise. Keep these appliances at their lowest speed setting and leave them switched-on at the other end of the baby’s room or in the next room if the noise is very loud. You can also use a table fan or a ceiling fan that generates white noise to keep the baby calm. Making white noise with your mouth: You may also soothe the baby by making “whooshing” and “shushing” sounds with your mouth. This works best when you place the baby in the crib right when they are settling down for their nap or nighttime sleep. 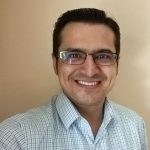 Using home appliances and generating white noise through your mouth are easier than using infant sleep machines, which have to be chosen with a lot of care. There are two significant side effects of using white noise for babies. 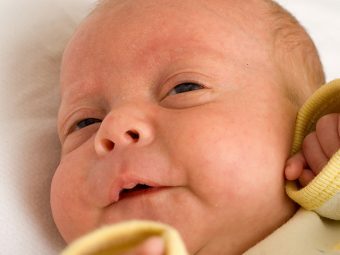 Long-term use of infant sleep machines may cause hearing loss. 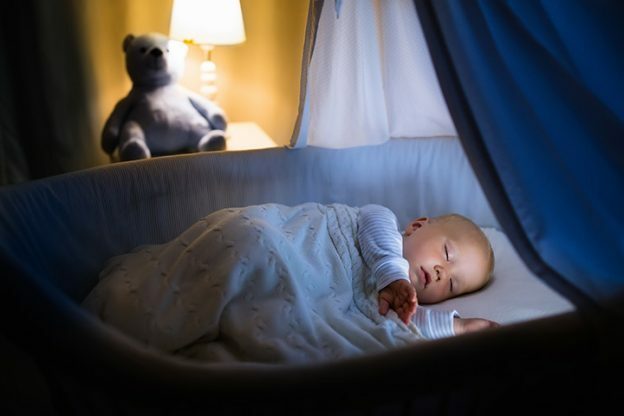 A study by the American Academy of Pediatrics notes that the white noise generated by the infant sleep machines is loud and could damage a baby’s auditory abilities (7). The recommended auditory limit for infants is 50 decibel A (dbA). But most machines generate white noises at a frequency of over 85dbA, which when played for several hours could cause severe auditory damage to the baby’s ear. In the long-term, it has the potential to cause hearing loss and even impact a baby’s speech development (8). The infant may develop a dependency. Excess use of white noise to soothe the baby could make them dependent on it. It means the baby may have a hard time self-soothing and falling asleep without white noise. Parents can avoid the side effects of white noise machines by taking some precautions. Place the machine away from the baby. The device should be kept at least 200cm away from the baby, or farther to prevent the sound frequency from going over 50dbA. Keep the volume low. Most white noise machines allow you to increase or decrease the volume. Keep the volume low or medium to prevent it from crossing the safe sound limit. Use infant sound machines for shorter duration. Do not use infant sound machines for an extended period. Use them for an hour right when the baby is about to sleep but not throughout the night, as that can damage the baby’s hearing. Choose alternatives or skip white noise some days. Try to soothe the baby a few days or nights without the white noise. Alternatively, create white noise with your mouth or use a conventional home appliance like the fan for the job to prevent the baby from becoming dependent on it. White noise can work wonders in calming your baby when you use it the right way. The ideal volume levels, the duration of use and the machine’s distance from the baby are what you must keep in mind for safe usage. As your baby grows older and learns to self-soothe, the dependency on white noise reduces. Have you used white noise to calm your baby? Share your experience with us in the comments section below. 8. Can Infant Sleep Machines Be Hazardous to Babies’ Ears? ; American Academy of Pediatrics. 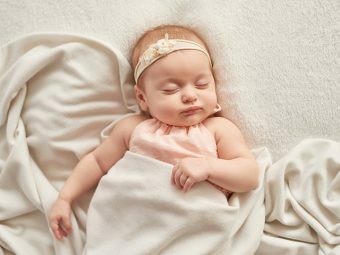 Why Does Baby Sigh During Sleep? 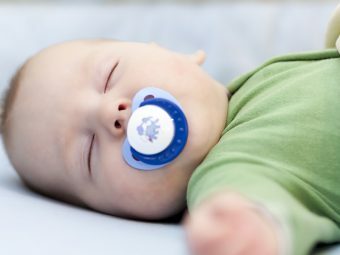 Can A Baby Sleep With A Pacifier?